On February 6, PREMIUM TIMES ran a story on some Nigerians who may run for president on the platform of the country's main opposition party, the Peoples Democratic Party (PDP) in 2019 and their chances. The aspirants are: former Vice President Atiku Abubakar; Governor of Gombe State, Ibrahim Dankwambo; former Jigawa State governor, Sule Lamido and former chairman of the National Caretaker Committee of the PDP, Ahmed Makarfi. Others are Governor Ayo Fayose of Ekiti State and a former Special Duties Minister, Tanimu Turaki. 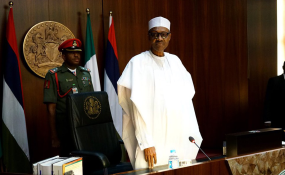 In this second part, Festus Owete reviews 22 other Nigerians who have declared their intention to challenge President Muhammadu Buhari at the poll, though the president is yet to indicate he would contest. While some of the aspirants have indicated the political parties on which they want to contest, others are yet to do so. Also, some of them declared their interest believing that the National Assembly will ultimately amend the Constitution reducing the age limit to run for president from 40 to 35. The list contains some serious aspirants and some who are probably just playing to the gallery by their declarations. Donald Etim Duke was the governor of Cross River State between 1999 and 2007 on the platform of the Peoples Democratic Party. He had served as Commissioner for Finance and Planning in the administration of Governor Clement Ebri between 1992 and 1993. Born in September 1961, Mr. Duke graduated in law from the Ahmadu Bello University, Zaria in 1982 and took his LL.M in Business Law and Admiralty in 1984 from University of Pennsylvania. In 2007, the former governor had shown interest in running for president. In May last year, he hinted of his plan to run for the position. "I do not have the flair for the legislature; standing up and sitting down at the chambers to raise a point. That was why I did not contest for the Senate but the presidency, after serving out my term as governor. "I have contested the presidency before; I will still give it a shot when the opportunity presents itself. I believe I still have the energy in me," he said at a programme in Lagos. Earlier this year, the former governor reiterated his intention to run for the nation's highest political office, saying "I am entitled to run for presidency of this country. Only on right circumstances I will aspire for it. I don't shy away from responsibility, I will aspire for presidency of this country. I have what it takes to be president of this country." Although, Mr. Duke belongs to the PDP, it is not clear if he would run on the party's platform as he recently identified with the Coalition for Nigeria Movement founded by former President Olusegun Obasanjo and launched on January 31. Mr. Obasanjo had said in a letter to President Muhammdu Buhari that neither APC nor the PDP could salvage Nigeria. As one of the leaders of the CNM launched on January 31, Mr. Duke may dump the PDP. The former had also joined forces with former CBN governor, Chukwuma Soludo, Pat Utomi, Olisa Agbakoba and Oby Ezekwesili to float Nigeria Intervention Movement (NIM) which said it would rescue Nigeria from PDP and APC. Kingsley Chiedu Moghalu is a former deputy governor of the Central Bank of Nigeria. Born in 1963, Mr. Moghalu, a political economist, lawyer and former United Nations official, hails from Anambra State. He is a graduate of the London School of Economics. He also read Political Science at the University of Nigeria Nsukka. He is currently a professor of practice in International Business and Public Policy at The Fletcher School of Law and Diplomacy at Tufts University in Massachusetts, U.S. While at CBN between 2009 and 2014, Mr. Moghalu served as deputy governor for financial stability as well as operations. He recently announced his intention to run for president though he did not disclose under what party he would do so. Undoubtedly, this is his first political outing as he is not known to have run or occupied any political position before now. Mr. Moghalu said the time had come for technocrats, intellectuals and experienced people to take power from Nigeria's career politicians. He said he would not be deterred from joining the race, in spite of speculations that 2023 was the year slated for Igbos to have a shot at the presidency. "It is the turn of any competent Nigerian to aspire for the post of presidency because career politicians have failed Nigeria," he said. Olufunmilayo Adesanya-Davies is a professor of Language and Communication Arts at the Rivers State University of Education. She has taught in the school for the past 30 years. Mrs. Adesanya-Davies was born on October 1962 in Ira, in Oyun Local Government Area of Kwara State. She studied at the Universities of Ilorin and Port Harcourt as well as North-western University, USA. Apart from teaching, she is also a cleric. She is founder of the Agape Bible Church. Recently, she declared her interest in the 2019 presidential race. Interestingly, she is nursing her ambition on the platform of the PDP, which has zoned the position to the North. "I am aspiring to be the next president of Nigeria. I am out to put laughter and joy on the faces of Nigeria," she said. "The tension is getting too much. The agenda is almost fully mapped out. Moreover, we have paid the price in Kwara State as the "State of Harmony" and it is going to happen from the North-central by the grace and mercy of the Almighty God. Mrs. Sonaiya belongs to KOWA party. She was the party's presidential flag bearer in the 2015 election. In that election, Mrs. Sonaiya, the only female candidate then, polled 13,076 votes representing 0.05 of the total votes cast. Born in 1955 in Ibadan, Oyo State, Mrs. Sonaiya, retired as a professor of French Language and Applied Linguistics at the Obafemi Awolowo University, Ile Ife before joining politics. In an interview with PREMIUM TIMES, Mrs. Sonaiya hinted of her plan to vie for the post of president again. "Of course, it is the person who emerges as the party's candidate after we must have conducted our primaries who will represent the party in the presidential elections. Who knows, maybe it would be me," she said when asked if she would run again. She said she was motivated to join politics partly because of her "concern about falling standards all around, especially as I had studied in the same university where I was teaching." She added, "I was concerned that students who belonged to my children's generation could not have the same standard of education I had. I realised that politicians determined the quality of our lives. I decided to quit the university and join politics." Thomas-Wilson Ikubese was born in Lagos on November 22, 1970. He hails from Delta State but practices medicine in Ondo State. He graduated from the University of Benin in 2000 and he is currently the Chief Medical Director of Sckye Hospital and Diagnostics Limited, with a vision to render charitable medical service to residents of Ondo State. He is also currently the state vice chairman of Nigerian Medical Association (NMA) and the association's national social/publicity secretary. Mr. Ikubese hinted he wants to run for president on the platform of the National Conscience Party (NCP). He said he decided to join politics in other to salvage the country from hardship and place it on the same level with global counterparts in terms of development. He said he wrote a book titled "My Prescription for Nigeria," in which he stated the 23 areas that must be addressed for Nigeria to become the "nation of our dreams." "Seeing that our present crop of political leadership might never implement these recommendations, I have decided to run for the office of the President of the Federal Republic of Nigeria, so that I can put machineries in place for the actualisation of these recommendations, which will birth the New Nigeria of our dreams," he said. The presidential hopeful, who uses 'YesWeFit' as his political slogan, recently visited former President Olusegun Obasanjo in his Abeokuta residence to inform him about his plan to unseat Mr. Buhari. During the visit, the aspirant warned that any coalition that throws up "ex-this and ex-that" as its presidential candidate cannot qualify to be a "third force." Mr. Nwosu, a lawyer, was born on December 14, 1977 in Olokoro, Umuahia in Umuahia South LGA of Abia State. He had lectured at West George College, Glasgow Scotland before joining Royal Bank of Scotland and later SERCO GROUP in Newcastle, England. He worked with the Justice Department and Legal Aid Agency from where he was seconded to Her Majesty's Courts and Tribunals. It was from the Tribunal he returned to Nigeria. Mr. Nwosu, though has not disclosed the party in which he will pursue his ambition, has already developed a manifesto with which he said he "would govern Nigeria, if elected." For instance, the aspirant said he would assemble an economic team that is not involved in partisan politics to handle the economy. His economic main objectives include, integrated rural development with special emphasis on agriculture development; reviewing of the policy of the oil sector; formulating measures to reduce the income gap between the rich and the poor and between rural and urban areas; and ensuring free trade, rapid industrialisation and technological advancement. On health, the aspirant said he would give priority to reform and put in place a good regulatory framework for the health sector in partnership with NMA and other relevant bodies. He also said he would upgrade University Teaching Hospitals to Medical Research Centres while a National Hospital would be built in every state of the federation. The 35 years old Adamu Garba hails from Jimeta, Yola North LGA of Adamawa State. He is the founder/chief executive of IPI Solutions Nigeria Limited, a leading cloud computing company. Mr. Garba 11 graduated in Electrical and Electronic Engineering from Kano State University of Technology. Although, he is yet to indicate the party on whose platform he would contest, the aspirant said he would make Nigeria great if his ambition materialises. "I think Nigerians should start to prepare for a new Nigeria dream by our great Nigerian renaissance project where each citizen will transparently measure our government in four key metrics, namely better education and training for our children, better standard healthcare facilities for all Nigerians, better market to transact in goods and services, and more money in their pocket as a result of improved trade," he said in a media interview. Mr. Garba said, if elected, he would discontinue with FAAC (Federal Account Allocation Committee), noting that with the creation of special geo-economic zones in each state, "we will support them to create their revenues locally and run their government." On education, the aspirant said, "We will take over the control of primary school education and transfer it under presidential task force of federal government. We will focus on training on skill-based, rather than academic-based training so that we can graduate young innovative minds." In an interview with SaharaReporters, Mr. Garba said he would not only increase the number of the geo-political zones to nine from six but also privatise the NNPC in other to make it more efficient and combat fuel scarcity. According to him, "NNPC is supposed to be one of the largest Nigeria strategic and diplomatic asset. We need to think NNPC like a big, state-owned enterprise that should be able to further Nigeria's interest globally. NNPC should completely be run by the government but privately managed, put it on stock exchange and allow private people to buy it." He is the Chief Responsibility Officer at Mothergold Consulting. He had worked as a regional coordinator of the Department for International Development (DFID). According to his published profile, Mr. Fagbenro-Byron holds degrees in Economics and law and a master's degree in Information Science. He has over 25 years of professional experiences covering law, consultancy, social and public service "with a rich and ever growing understanding of international development issues, global affairs, African affairs, Nigerian history, law culture and political economy." Recently he declared his interest to run for president on the platform of KOWA Party. "I, Citizen Adesina Ayodele Fagbenro-Byron, will be seeking my political party's ticket for the presidential election of 2019, and if successful your individual support in order to win what will be momentous election of our time and significant in our history. "I believe I have the competence and capacity to be the President. My unique offer is to champion the restructuring of the socio-economic and political institutions in order to create an equal access and equal opportunity society for all Nigeria and all citizens of Nigerians many of whom are born with so much talent and potential, as the much-touted potential of Nigeria is actually the potential of its ordinary citizens." Mr. Udeogeranya, 46, is a member of the APC. He was Lagos State chairman of the defunct African Renaissance Party (ARP) and Lagos League of Political Parties. For him, APC would only retain the presidency and other top political positions "if the party offers him its ticket in 2019." "If the feelers with the electorate can be relied on, then the surest way for my party to retain the presidency, gubernatorial, senate and House seats can only be assured with my emergence as the party's presidential flag bearer for 2019 presidential election," he said. "My nomination as APC presidential flag bearer will redeem APC chances and retain won seats as my presidency will redeem Nigeria from a near failed state to a viable and prominent economic giant state in the world. I will encourage stakeholders in my party to embrace my candidacy as the party's surest way to success in 2019." Mr. Udeogaranya sees no reason why Mr. Buhari should seek re-election. "Mr. President has not given Nigerians a more united Nigeria than he met it. He has not given Nigerians a safer country and a better power, road and other infrastructure than he met it. Buhari has not given Nigerians better civility rights and freedom of expression than he met it. "As a matter of fact, Mr. President has not given Nigerians a reason why anyone with sound mind should contemplate his re-election bid," he said in a report by Nigerian Oracle, an online medium. The aspirant said if elected he would not support restructuring, saying the problem of Nigeria "has nothing to do with restructuring the country but more to do with constitutional amendments." Mr. Durotoye was born in Ibadan, Oyo State in 1971. He is a graduate of Business Management from the Obafemi Awolowo University and holds a master's degree in Business Administration/Strategic Management from the same university. Mr. Durotoye, a motivational speaker and leadership coach, is running on the platform of Alliance for New Nigeria (ANN) which he joined formally on February 22. At the forum, FD, as he is fondly called, said he was a critical change agent and mobiliser, adding that his foray into politics would not be a threat to his commitment to time-tested values and principles, required for good leadership and good governance. The presidential hopeful, at another forum, said the problem with Nigeria is that "we have not yet seen a system that produces good people in governance," adding "the leadership system we have in Nigeria is what I call "selectocracy." He described "selectocracy" as a system "whereby access to position of authority and power is to a large extent determined by a few people who have a higher interest in themselves and their own selected interest that they have in the interest of the general public." Ahmed Buhari was born on April 7, 1978 to a soldier father and a housewife. He hails from Kontagora in Niger State. Mr. Ahmed holds a degree in Geology from the Federal University of Technology and master's degree in International Trade and Marketing from Cavendish College, London. He was also trained as a Geographical Information System and Spatial Analyst in Manchester Metropolitan University. He is the chief executive of Skylar Incorporated, an Information Technology outfit with over 50 staff. In an interview with BusinessDay, Mr. Ahmed said he decided to run for president to ensure that Nigeria regains its status as the giant of Africa. "In 2016, I decided to stop standing on the sidelines and pass comments of displeasure. I decided to understand why a country we have continually failed to progress alongside other aspiring nations. I decided that the only way to make a difference is to participate in the process that gives us our leaders," he said. "I also want to use this movement to motivate as many young Nigerians as possible to get involved in leadership and politics. Constitutionally, I have the right to contest for the office of the president of the Federal Republic of Nigeria and my vision is to have a unified country where the people are secure, power is decentralised and economically viable. "I want to run a government where the lost hope of the younger generation is restored, fears of the older generations are erased, dignity and prosperity of our dear country regained and Nigeria becomes the giant of Africa and the best economy in the world. All this can be achieved if we adopt a technologically-driven system." The president's namesake is yet to decide what party he would use to realise his presidential dream though he said he has "been approached by some parties." He was born on December 1, 1982. He is an indigene of Elele in Rivers State. The U.S. based Emejuru is the proprietor of Liberty Approach and Allied Consults (LAAC), a business consulting firm which provides relevant, substantive information regarding government policies in Nigeria. In January, he spoke of his presidential ambition in Daily Times. "As I ponder on our Motto, "Faith Peace, Unity and Progress," have we truly lived up to its creed? Each has been received within the challenges of yesterday, but it is important to remember that all can be reconciled as we look to a new beginning. "A beginning of future to remember, where every citizen has the opportunity to receive good healthcare, where a student can attend school and not have to worry about issues that interfere with hearing, where a woman can feel confident in knowing that she can find work by selling her CV (Resume) and not herself, and a child who can sleep at night knowing where the next meal is coming from. "There are many issues, reasons why I will be running for the office of the President of the Federal Republic of Nigeria, and so I ask for your support so that together, we will reach our destination in triumph." Mr. Emejuru is yet to disclose the party on whose platform he wants to actualise his ambition. He said he is a registered member of the APC though currently "independent." The 41-year-old Tsado hails from Niger State. He graduated from University of Technology, Minna where he studied Mechanical Engineering. He has worked with EcoBank and Intercontinental Bank. His mantra is "A new Nigeria is possible" while his campaign theme is "Hope 2019." He said within 100 days in office, he would have fixed the economy. He also said his adminsitration within that period would have "started a process of putting some of he refineries we have in Nigeria in place. We would have had a discussion with GE to boost our energy just like Indonesia did a couple of months ago." Not much is known about him yet. Popularly known as "Seyi Law" Mr. Aletile is a renowned comedian and actor. He will be 35 on June 22. He hails from Ilaje in Ondo State. He declared his presidential ambition on his Instagram page last November. "I am Aletile Oluwaseyitan Lawrence aka "Seyi Law" and I am running for the highest office in the land in 2019," he said. "It is time to take the bull by the horns; youthful and working towards a new Nigeria. "I believe I will also pull a Donald Trump on Nigeria in 2019 and the campaign has started. Why aim low when you can aim high?" Although, it is not clear if his declaration was a joke, the comedian said he believes the status quo should change and that it was what Nigeria needed to regain its place as a nation that should be reckoned with. He said the energy and knowledge of the Nigerian youth must be exploited positively. At another forum, he said, "I believe in a Nigeria that we will be proud of, a new Nigeria where leaders are proactive, a Nigeria where the strength of the youths will be maximised, a Nigeria where the wisdom of the elders is not relegated. "I believe in Nigeria where business owners will not take advantage of citizens because of government's failures to do the right things, a Nigeria where the leaders will speak up and speak right... "
Yul, like his father is a popular actor who stunned Nigerians when he declared his intention to vie for the November 2017 election in his native Anambra State on the ticket of Democratic Peoples Congress (DPC). He lost woefully in that election as he could only muster 145 votes losing to the incumbent, Willie Obiano. But this did not deter him from aiming higher. Recently he dropped the hint that he might run for president. "So, it is my birthday today, 7th of January, 2018. So, happy birthday to me," he said in a video posted on Instagram. "2018 is just unfolding. We pray for more blessings. So let's just keep our fingers crossed. Who knows, I may just decide to run for president of Nigeria this time in 2019, and I will win." He is a comedian and actor. He was born in September 1978 in Lagos though he hails from Abia State. He is a University of Benin graduate of Sociology and Anthropology. Mr. Okpocha indicated his plan to vie for the nation's top political job since 2016. He had said on his media page that he would run for president if Donald Trump emerged victorious in the U.S. presidential election. After Mr. Trump's victory, the comedian released his first portrait photo as well as his intention to contest. He said, "My esteemed people, in fulfilment of my threat/promise regarding the outcome of the just concluded U.S presidential election, I am announcing my candidacy for the Office of the President of our dear country in the 2019 general elections. Consultations are ongoing and I will announce at a future date under what party. #MakeNigeriaBrightAgain." Since this declaration, Mr. Okpocha has not done anything significant to pursue the ambition, an indication that he might just be plying his trade as a comedian. Mr. Lewis is another Nigerian youth seeking to run for president though not much is known about him. In a statement published by NAIJ.com, the aspirant said it was time for youth to run the affairs of Nigeria and put a stop to electing "the same set of politicians who have been in charge of the country for a long time." "I have a lot to offer because I am from a very poor home and I have seen deep into what is going on in Nigeria; how the youth, masses, unemployed and all Nigerians have been treated." Mr. Ojajuni was born on December 28, 1978. He hails from Ugbo Kingdom in Ilaje area of Ondo State. He studied law at the Lagos State University and later attended Ghana Business School. He is a businessman with interest in fish importation. He is also a consultant to Vega Foods, Singapore on Africa investment and consultant to Delta State Investment Agency. Mr. Ojajuni once contested unsuccessfully for the Lagos State House of Assembly on the ticket of the Alliance for Democracy (AD) to represent Kosofe constituency. In 2016, he also aspired to be governor of Ondo State but was unsuccessful. He said he is running for president on the platform of Labour Party (LP). While declaring his intention, Mr. Ojajuni said, "In response to the clarion call of my people, I have wholeheartedly decided to offer myself, to fulfill the long time yearning and aspiration of my people, hoping to contest in a free and fair election, come March 2009. "After due consultation and endorsement from various opinion leaders, interest groups and members of my party, and God on my side. I look forward to a fair competition from co-aspirants within and outside our party. "If given the opportunity, I will not see it as a right but as a privilege and a call to serve while promising to put the interest of the generality of the people before mine, in all honesty, transparency and sense of duty. I promise not to betray the confidence reposed in me. "I look forward to a very robust and issue-based debate and opportunity to tell the world what I stand for and what I can offer humanity if given the opportunity to serve." Mr. Omosule was born on September 3, 1969. He hails from Ondo State. After his secondary education in Nigeria, he proceeded to the United States where he was admitted to read mechanical engineering at the City University of New York but dropped out in his third year following the ill-health of his grandmother. Mr. Omosule is a board member of Scope-America Outreach. He said he is running for president, "because of the urgency of now; because I believe that there is such a thing as being too late and this hour is almost upon us." He added, "If given the opportunity to lead and serve the people of Nigeria, I will build and sustain an honest, loyal and sincere government. I will make justice transparent in our government, in our fundamental philosophy and our operational framework in running the affairs of this great nation." Mr. Ladaja hails from Borno State. He is is 34-years-old, an age which may not qualify him to run for the office of the President. The current age limit to run for president is 40. Nevertheless, the said he wants to contest because he "believes he can "make a real difference." "When I look around Nigeria and travel around the country listening to people's stories, I know the system has failed ordinary Nigerians. The quality of our country is declining and our government neglects to meet the needs of our people," he said in an interview with NAIJ.com. Mr. Ladaja pledged to strengthen the educational system, grow the economy and fight corruption. The 34-years-old from Ekiti State is based in the U.S. He graduated from the Texas Southern University where he studied Accountancy. Mr. Omotosho was a Fellow with President Barack Obama's Presidential Organisation, Organising for Action, where he helped in oranising African-Americans towards a successful second term for Mr. Obama. In an interview he granted Pulse website, Mr. Omotosho said he decided to run for president, "because Nigeria has been ruined by people with no agenda but just there for selfish and unnecessary reasons." He said Nigeria, at this moment, "needs someone that has proven record of selfless service and that is not a thief." Mr. Omotosho said if elected, he would, "fix the nation's electricity problem, professionalise the security services and unify the country." He is currently the national chairman of Abundant Nigeria Renewal Party (ANRP), one of Nigeria's newly registered parties. Born in 1971, Mr. Fasua got his first degree in Economics from the old Ondo State University and a master's degree in Financial Markets and Derivatives from the UK. He has vast experiences in the banking sector. He is the Chief Executive Officer of Global Analytics Consulting Limited. Mr. Fasua wants to be president on the platform of the party he leads. The newspaper columnist and TV analyst declared his intention in November 2016 on his Facebook page. He said in a recent media interview on why he is running: "I was inspired by the need to stop complaining about how things are, or how badly Nigeria is run, and to be responsible enough to do something about this country myself. Plus I have many strong ideas about how things should be run. As an economist, that is all I think about. I have written four books on the Nigerian socio-economy, and perhaps over 2000 articles."